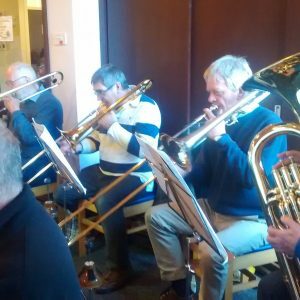 The Blackburn Symphony Orchestra is fortunate in having an established and very experienced brass section. 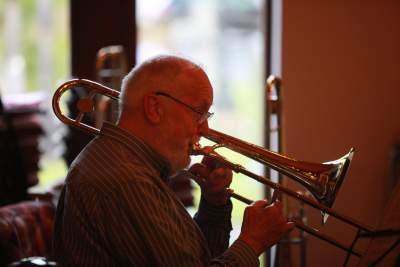 Most of the players, Peter Sutcliffe and Mike Lormor (trumpets); John Holt and Graham Rouse (trombones) and Paul Roscow (tuba) have been with the orchestra for many years. 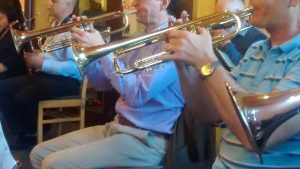 The newest members, Stuart Grills (trumpet) and Ted Hoyle (bass trombone) are no strangers to many of the section, as they have played together in other NW orchestras including the Wilmslow Symphony Orchestra, Stockport Symphony Orchestra and Harmonie 84 Wind Orchestra. Stuart, Ted and Mike were also members of the Northern Brass Consort in the 70’s and 80’s. A lot of the players began playing at school before going on to play at youth and county level. 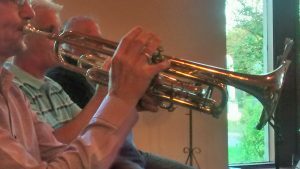 Peter’s father was a big band trumpet player and John’s father was also a keen amateur musician. 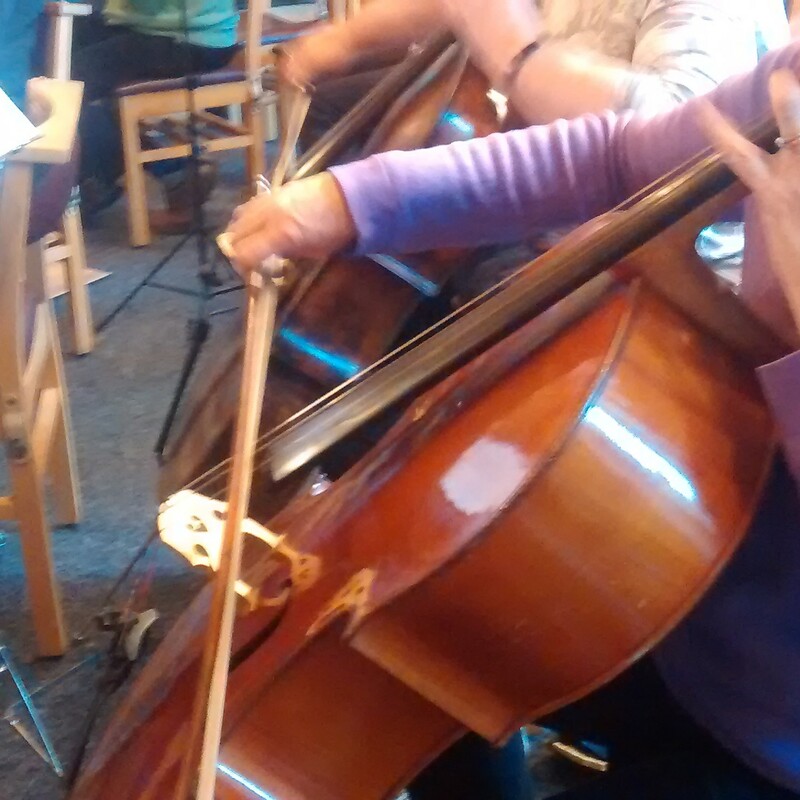 Many are from teaching backgrounds, though not always music. John was a Head of house and maths teacher and Paul was Head of modern languages teacher who speaks fluent Russian – a great help in interpreting the Shostakovich parts. Peter is a research engineer at Liverpool University and Graham worked as a music teacher but now has his own woodworking business. People sometimes ask ‘ what’s it like playing brass in an orchestra. The famous trumpet player John Wilbraham (Jumbo to his friends and one time principal trumpet of the BBC Symphony Orchestra) said ‘it’s 90% boredom and 10% absolute terror’, when after counting endless bars rest you are suddenly called on to play complex and exposed solos. But, it’s a lot of fun! The Autumn Concert has lots for the brass to do. In addition to the regular three trombones and tuba, the Rimsky Korsakov, Dukas and Tchaikovsky all require four players in the trumpet section. In the Dumas and Tchaikovsky this means two trumpets and two cornets, each instrument with quite distinctive contributions and solos. We are pleased to welcome Harvey Sprake as our fourth trumpet and second cornet player. 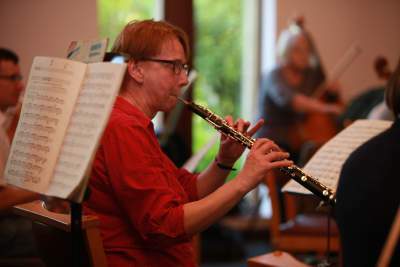 Until recently, Harvey played with Ormskirk Symphony Orchestra but Mike and Harvey go a long way back, as they played together in the University of Manchester Symphony Orchestra when they were students.